Worldwatch Nourishing Planet Interview with Seth Itzkan - Published | Planet-TECH Associates: Trends. Innovations. Opportunities. Affiliation: President of Planet-TECH Associates, a consultancy focusing on trends and innovations. In 2011, Seth spent six weeks at the Africa Center for Holistic Management in northwest Zimbabwe, the sister organization of the Savory Institute in Colorado. While in Zimbabwe, he saw firsthand the restoration of degraded lands through improved land and livestock management. Since his return to the United States, he has advocated for holistic management to be considered as a methodology to address both desertification and global warming. Seth recently gave a TEDx talk on the topic of “Reversing Global Warming with Livestock?” and presented at the Center for International Environment and Resource Policy (CIERP) at the Fletcher School at Tufts University. With colleagues at Tufts, he is helping to organize a conference in January 2013 on holistic management, titled “Creating the Future We Want: Holistic Solutions to Global Challenges.” Seth is co-manager of the Google group, Soil-Age, which explores the opportunities and potential impacts of soil restoration. He is a graduate of the Tufts College of Engineering and the University of Houston Masters of Science Program in Studies of the Future. What is holistic livestock management, and how does this idea challenge conventional grazing systems? Holistic management seeks to restore grassland ecosystems by using livestock as a proxy for the wild herds of grazing ruminants that the prairies and savannas of the world co-evolved with and depend on. Due to the pressures of predation, natural herds form tightly packed groups that are continuously on the go, moving in a pattern that is unlike conventional livestock management. This natural herd action is essential to plant grazing and nutrient and water recycling and distribution. It was the abundance, not the paucity, of these grass-eating creatures that sustained the verdant regions of most continental interiors. Thus, holistic management recognizes that fully functioning grassland ecosystems cannot be sustained without herds of grazing animals. Recognizing the severing of the ecosystem that resulted from the decimation of the great herds, holistic management attempts to restore balance by moving livestock in a manner that simulates the pack density and mobility of the wild grazers. This helps recreate the desirable ruminant impact while eliminating deleterious effects of conventional livestock management. It is achieved through adherence to a grazing plan that stimulates plant growth, provides natural fertilization, and keeps the herds from returning to eat the same plants until they are fully re-grown. Holistic management poses two major challenges. First, it challenges the idea that conventional grazing—including keeping livestock sedentary and corralled in permanent fixtures—is sustainable. Second, it challenges the idea that the weight of livestock is all that matters to the rancher. Holistic management strives for economic, social, and environmental success factors. By focusing on more than one variable, we can see improvements across all three. Natural systems, like grasslands with ruminants, cannot be managed with reductionist thinking. There must be a holistic framework. More grass cover:This means an increase in the density of the plants. In a healthy grassland system, there should be no space between plants—i.e., no bare ground. Any water from the sky should land on leaves, not dirt. Achieving this state using livestock is possible through holistic management, even in areas of low seasonal rainfall. When animal movement is done properly, plant growth is stimulated through grazing at the opportune time, soil health is enhanced with essential nutrients, and the land is “impacted” through hoof action, trampling plant litter and seeds into the ground along with manure to assure cover for new growth and moisture retention. Increased surface water:Increased surface water is one of the most important indicators of ecosystem recovery. In low, seasonal-rainfall grassland and savanna environments, the measure of surface water health that a land manager can readily see is how long springs or watering holes sustain into the dry season. When the soil is healthy, it is rich with organic matter that absorbs water, pulling it down and replenishing the water table. When soil is depleted, rainwater flows away, creating gullies and carrying topsoil with it. The erosion process can drain the water table. However, the opposite is also true. Improved soil health will replenish the water table. As this happens, the change in surface water will become apparent: streams and surface pools remain wet longer into the dry season and may also widen. Additionally, grass cover in riparian areas will extend to the edge of streams, and there will be an increase in aquatic plants and animals. Enhanced plant and wildlife diversity: As grasslands recover, plant and wildlife diversity increases. This is driven by the changing biological composition of the soil—the bacterial and fungal communities that hide away carbon and exchange nutrients with roots. 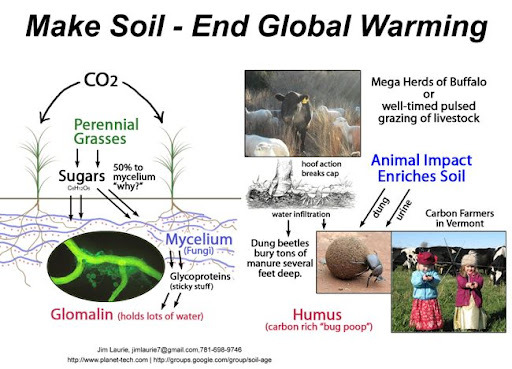 This soil community is enhanced by ruminant manure, which is loaded with water, minerals, and billions of essential bacteria that serve as “reinforcements” to their fellow microbes in the ground, particularly important in the dry season. As plants diversify, so will the bugs, birds, and larger wildlife. Eradication of problem or invasive species:As properly timed grazing restores the grassland soils to their prior state, new conditions will favor the native species. Invasive species that had benefited from depleted soil will no longer be advantaged. Additionally, livestock, including cattle and goats, can be used as tools to directly eradicate undesired species. For example, goats can eat prickly pear, and cattle can disrupt the life cycle of cheatgrass and trample and kill woody brush. Why is holistic management significant to the issues of desertification and mitigating and adapting to climate change? Desertification coincides with the removal of the natural impact of herding ruminants. Although much desertification is rightly blamed on poor ranching and agricultural practices, holistic management postulates that the rootcause of grassland desertification worldwide is the decimation of large herding animals, and their predators and cousin creatures that were essential to ecosystem health. In North America, for example, we saw the elimination of approximately 70 million buffalo, 2 million wolves, and 4 billion (yes, billion) prairie dogs. By the 1890s, most of these creatures were near extinction. The dust bowls of the 1930s are attributed to drought and poor farming methods; however, the seeds of desertification were set nearly a century earlier when the wholesale slaughter of native wildlife became common practice. Holistic management offers a solution to this. It presents a natural approach for restoring grasslands that in turn play a major role in atmospheric carbon capture and climate stability. Although rarely given central billing in the climate change narrative, grasslands are actually the largest terrestrial ecosystem and one of the greatest stores of atmospheric carbon, on par with, if not greater than, that of forests and the atmosphere itself. Unlike forests, however, where carbon capture is predominantly held above ground and only for the lifetime of the trees, grasslands build soil that can grow to meters deep and sequester carbon for millennia. The challenge for the climate change community is to realize that grasslands cannot be restored without the impact of herding ruminants. And without the carbon capturing services provided through grassland photosynthesis and soil formation, there is no mitigation of global warming. Even if all fossil fuel use is ceased, without addressing the worldwide problem of atmospheric carbon loading through land degradation, we will continue down the path of a runaway climate catastrophe. One way or another, large grazing animals in significant quantities are on the critical path to a livable future for humans on this planet. The phrase “livestock are responsible for 18 percent of greenhouse gas emissions” also underscores a profound misunderstanding. It is not the livestock that are responsible for these significant greenhouse emissions, but the fossil fuel-intensive livestock industry. Any living creature is naturally in balance with its ecosystem, including all the minerals and gases that enter or leave it. The 18 percent figure stems from the 2006 UN Food and Agriculture Organization (FAO) report, Livestock’s Long Shadow: Environmental Issues and Options. This report included all production-related environmental impacts, such as fossil fuels, irrigation, grain, fertilizers, and land degradation. It also accounted for the methane problem of CAFOs [factory farms] where manure is held in anaerobic lagoons. It is a proper indictment of the fossil fuel livestock industry, which is indeed destroying land and contributing to global warming. This report, however, has nothing to do with animals living in balance with their surroundings, nor with holistic management, the whole point of which is to help stop the degradation of industrial livestock production and restore grasslands to health through proper ruminant action. Seeing as holistic management uses range-fed cattle that are managed for ecosystem recovery (and thus carbon capture), none of the numbers associated with the FAO report are germane. They are entirely different systems. The only thing that is common is the cattle, and cattle aren’t the problem: the industry is, and that must change. Holistic management provides a model for what that change could look like, and it would be helpful for future assessments to consider this option. Range-fed cattle that are managed for ecosystem recovery will be helping to enhance grass cover and build soil and thus will actually be carbon negative. This will be true until such a time that the soil is maximally restored. That could be decades or centuries. It’s important to remember that ruminants evolved to be in balance with grassland ecosystems, playing essential roles in maintenance of plants and soil health. Atmospheric loading of carbon dioxide in the case of industrial livestock does not come from the animals, but from fossil fuels and improper land use. Those are human-induced ills that can be changed. Additionally, the methane released by ruminants should be balanced by the intake of methanotrophic bacteria naturally present in healthy pastures. Finally, manure should be in the fields, building soil, not in anaerobic lagoons. The conclusions of the FAO report should be a call for us to do the right thing, and that is to stop growing grain for cattle and to restore livestock to their proper place as soil-enhancing ruminants. The potential of carbon capture via grassland restoration is enormous, and without proper ruminant action, either through wild herds or livestock managed as a proxy, desertification will continue and this opportunity for carbon capture will be lost. You spent six weeks at Zimbabwe’s Africa Centre for Holistic Management (ACHM). How do experiences with holistic management in southern Africa relate to western rangelands of the United States? ACHM is a 6,000-acre Holistic Management instructional ranch and learning site on communal lands in Zimbabwe. The terrain is “high veldt,” or high desert, similar to northern New Mexico, with a mix of arid grassland and forested savanna ecosystems. The biomes in southern Africa are quite similar to those on western rangelands in the United States, as are the needs and goals of the ranchers and agriculturists in both regions. The successes in southern Africa show that even in the world’s most impoverished areas, where the mismanagement of land and livestock has created high rates of desertification, reversal of fortunes is possible. Using livestock as a restorative tool can increase the grass cover, improve the water cycle, and provide viable livelihoods for land managers and their communities. If it can happen in southern Africa villages, it can—and does—happen on the American ranch.The Savory Institute in Colorado helps facilitate training and implementation, for example, and a new organization, Grasslands LLC, provides an outsourced ranch management service utilizing holistic management practices. On a personal note, what I found most revealing was the story from one Zimbabwean village woman about how, in the past, before holistic management practices were begun, the presence of biting ants made walking in the field intolerable. People without shoes had to wear plastic bags on their feet. The ants also attacked the baby goats and birds. It was horrible. Authorities told villagers the only treatment was expensive chemicals. However, once holistically managed grazing was started and the grass cover improved, the ant problem vanished. This is an invasive species issue, but it’s also much more than that. It’s a human story. People anywhere will want to benefit from healthy land. Nobody wants biting ants. The potential for integrating holistic management into development policies is enormous and grows as the failures of our current models become more apparent and costly. The ranch in Zimbabwe hosts a steady stream of representatives from development NGOs who are eager to learn about holistic management and put the tools into practice. They are looking for solutions that are practical, affordable, and that can simultaneously address the multitude of issues that accompany land use decisions. There are pilot projects throughout Africa and growing interest for major efforts throughout Zimbabwe, Namibia, Kenya, and South Africa. In January 2013, the Center for International Environmental Resource and Policy (CIERP) at the Fletcher School at Tufts University will host a conference on holistic management, titled “Creating the Future We Want: Holistic Solutions to Global Challenges.” In addition to showing the benefits of holistic land and livestock management, this conference is intended to show that the holistic framework for decision making can be used in any situation involving the management of complexity, as do all development projects and policies. The challenges of integrating holistic management into development policy are threefold. They are: 1) the fragmentation of traditional policy formation (rather than dealing with multiple development issues in unison), 2) the frequent misrepresentation of holistic management in academic literature (often associating it with rigid grazing systems), and 3) the reticence of policy institutions to entertain any policy that includes livestock as a “solution.” Although each is a formidable challenge, there is encouraging progress on all fronts. The paradigm hurdle that most policy institutions have yet to clear, is that the same creature that contributed to soil erosion is also essential for its repair. The moment we shift our collective mental rudder toward a worldview that includes properly managed livestock as an agent for restoration, is the moment that previously intractable problems cease to be quandaries and we are on course toward a hopeful future. Esteemed policy institutions, such as Worldwatch, can be leaders in this transformation. For more information on holistic management, visit the Savory Institute website. To read the full text of Seth’s interview, click here. Now it’s your turn: Do you think livestock have a role to play in mitigating climate change? Please let us know in the comments below. Carol Dreibelbis is a research intern with the Worldwatch Institute’s Nourishing the Planet project.